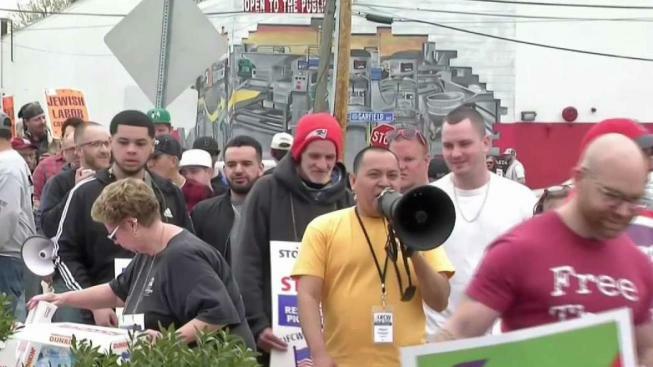 Dozens of striking workers spent the day outside one of Stop & Shop’s Somerville stores, demanding a new contract and yelling at customers who crossed the picket line. "We're all willing to stand here as long as it takes until we get a fair deal," striking worker Kristen Johnson said. The strike, which entered its fourth day on Sunday, started after contract discussions stalled. The United Food and Commercial Workers union said the impasse is over “unreasonable” wage and benefit cuts, something the grocery chain denies. In Connecticut, U.S. Sen. Richard Blumenthal and several other Democratic politicians, including Lt. Gov. Susan Bysiewicz, met with Stop & Shop employees picketing at several Connecticut locations on Sunday. Blumenthal says he is telling the strikers "they're fighting not just for themselves, but for working families across America." More than 31,000 workers from more than 200 stores in Massachusetts, Connecticut and Rhode Island are involved in the strike. Stop & Shop said it’s disappointed with the strike, saying it’s offering across-the-board raises and benefits that are better than what many of its competitors offer.